The Board is responsible for the overall governance of the affairs of Roger Neilson House. 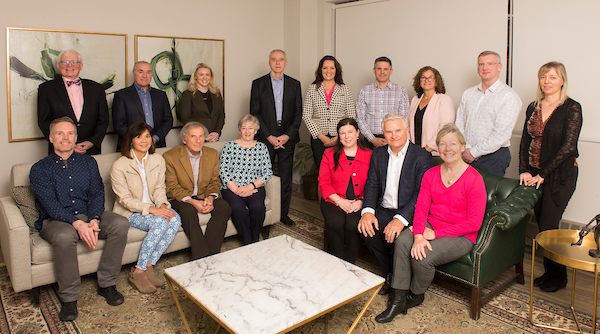 Bottom Row from Left: Brad Weir (Ex-officio Director), Ruth Hartanto (Past Chair), Jeff Polowin (Secretary), Anne Huot (Director), Megan Wright (Ex-officio Director), Les Bell (Chair), Alexa Brewer (Director). Missing from photo: Dr. Christina Vadeboncoeur (Medical Director). Click on any Board Member’s name to view their bio. Les Bell is a lifetime Ottawa Resident, a graduate of Brookfield High, Carleton University (BComm ’81) and earned his Chartered Accountant designation in 1984. Les owns and operates Lincoln Heights Ford and has been the Dealer Principal of the dealership since 1998. Les is inspired by the community spirit that is very prevalent in all corners of the Ottawa region and he is active in his many roles to contribute to that community spirit. Les is happily married to Sheila who also a lifetime Ottawa resident and they are both very proud of their four children, Brendan, Evan, Ben and Emma. Les is a sports enthusiast. Les was first introduced to Roger Neilson House in 2008 as a member of RNH’s Finance and Audit Committee. Les was appointed to the Board June 2010. Mike Lupiano is an Ottawa native who attended both the University of Ottawa and Carleton University, and graduated in 1977. Mike spent the first 30 years of his career in Human Resources leadership roles at Mitel, Cognos, Lumonics and Tundra Semiconductor and is currently a Partner in a boutique executive search firm. Always appreciative of the fabulous city we live in here in Ottawa, a sense of community and “giving back” has always been a priority for Mike. He has served on the Board of Directors at St. Patrick’s Home and is presently on the Boards of the Alzheimer Society of Ottawa and Renfrew County and Serenity House a substance abuse treatment organization. Mike is married to Kathleen, a retired high school science teacher and is blessed with two grown daughters and a grand-daughter, who keep him young. Previous to joining the Board in 2006 Ruth Hartanto was a member of the Children’s Hospital of Eastern Ontario’s Family Forum and participated in the planning phase of Roger Neilson House as a family representative. She has been involved in children’s health care since the birth of her daughter, Sydney who was “medically fragile and technology dependent.” A CHEO “frequent flyer,” Sydney also visited Roger Neilson House many times before she passed away in April 2009. Sydney’s star now hangs in the Roger Neilson House playroom. Ruth has presented the family perspective on health and home care to many groups including medical staff, community health care teams and medical students, speaking on the need for family centered care and continuity of care. She previously chaired the Roger Neilson House Family Advisory Committee and sits as a director in the Canadian Family Advisory Network Steering Committee. A corporate fitness consultant and fitness instructor, Ruth and her husband Thom enjoy many outdoor activities with and without their two sons. Jeff Polowin was born, raised and educated in Ottawa graduating from Glebe Collegiate and Carleton University. He is currently a senior vice president with Hill and Knowlton Canada after a career in the media and 6 years in the Mayor’s Office with Jim Durrell. As a lifelong resident of Ottawa, he has combined his work experience with a commitment to put something back into the community. This includes a 2 year stint as the Chair of the Queensway Carleton Hospital Board of Directors and his current membership on the Regional Cancer Foundation’s Courage Cabinet. Jeff and Angie have three children and eight grandchildren – 11 additional reasons for his involvement in Roger Neilson House. He was appointed to the Board in June 2011. Ian is a partner of Hendry Warren LLP Chartered Accountants. A graduate of the Queen’s University School of Business in 1977 and was admitted to the Institute of Chartered Accountants of Ontario in 1979. Ian is also a member of The Society of Trust and Estate Practicioners and a Certified Financial Planner. Ian has been involved with many community organisations including the CHEO Foundation, The Kiwanis Club of Ottawa and is a past chair of the Roger Neilson House Board of Directors. Ian was reappointed to the Board in June of 2014 and is a member of the Finance Committee. Alexa Brewer brings extensive knowledge related to health systems and health policy to the Roger Neilson House Board. Alexa has significant governance experience within the healthcare sector, and has most recently completed two 3-year terms as a director on the Board of the Champlain Local Health Integration Network. A nurse by background, her career also includes senior roles in the federal government, and she has significant expertise in the areas of health systems integration, governance and health policy as well as information management and technology. Alexa has a Bachelor of Nursing from McGill University and an MBA from the University of Ottawa. On December 1st, 2017 Anne Huot assumed the role of Vice President of Child Development and Community Services at CHEO. This portfolio includes the OCTC, mental health, palliative care, genetics, autism and rehabilitation programs, patient experience, complex care and the community discharge. She is co-chair of the Special Needs Strategy Planning process in Ottawa and supports all planning tables across the region. She brings enthusiasm and energy in leading others through transformative change. Previously Anne was the Executive Director for OCTC at the time of amalgamation of CHEO and OCTC in October 2016, and played a lead role in integration of programs and services to create a system of care for children and youth. From 2010 to 2016, Anne was seconded to the Ontario Association of Children’s Rehabilitation Services (OACRS) on a part time basis to lead the development of a new clinical information system (GoldCare) across 17 children’s treatment centres in Ontario. Caitlin became involved with Roger Neilson House six years ago when she and her husband Chris Neil were named the honourary chairs. Caitlin sat on the board of the Ottawa Senators Foundation for four years, where she was involved in various fundraising efforts. Caitlin and Chris reside in Ottawa with their three children, Hailey, Cole, and Finn. Caitlin has developed special relationships with the children at Roger Neilson House and is excited to further become involved with the activities in the house. Dr David Creery is a Pediatric Intensive Care Physician and Medical Director of Patient Safety at the Children’s Hospital of Eastern Ontario (CHEO) in Ottawa, Ontario. He received his medical degree from the University of Western Ontario in 1989. He completed training in Pediatrics at the University of Ottawa (1994) and Pediatric Critical Care at the University of Toronto (1998). He was the Division Chief of Pediatric Critical Care Medicine and Medical Director of the PICU at CHEO from 2002 until 2016. In 2010 he completed a Masters of Health Science in Health Administration with a focus on Patient Safety from the Department of Health Policy, Management and Evaluation at the University of Toronto. Since 2011 he has been an Investigating Coroner for the City of Ottawa. Robert has been practicing with Burke-Robertson since 1992 and was with Soloway Wright from 1969—1992. His areas of practice include Civil Litigation, Criminal Litigation and Supreme Court of Canada Agency. Robert has been active in a number of professional associations and committees including: the County of Carleton Law Association – Trustee from 1979 – 1987; President 1986 – 1987; the Canadian Bar Association – Member of Council from 1982 – 1984; and 1986 – 1987; the Advocates’ Society – Director from 1977 – 1979; the Chief Justice’s Committee of the Bench and Bar (Province of Ontario) from 1984 – 1990; the Ontario Court Management Advisory Committee (Province of Ontario) from September 1990 to 1996; the Supreme Court of Canada Liaison Committee; (Canadian Bar Association from 1985 to 1990); the Registrar’s Ottawa Agents Practice and Procedures Committee (Supreme Court of Canada) from 1991 – present; Lecturer – University of Ottawa Law School – Trial Advocacy from 1982 – 1989; Lecturer – Bar Admission Course (Ottawa) – Criminal Procedure from 1979 to 1999; and Fellow American College of Trial Lawyers. Born and raised in Ottawa, Ontario, Jacqueline Belsito is a fundraising and marketing professional with over 28 years of experience. After graduating from Algonquin College, Jacqueline began her career in the high tech sector with marquee companies such as Corel, Cognos and Mitel. A career shift into philanthropy saw her providing leadership for hospitals, universities, and social organizations for over 17 years. In her current position as VP of Philanthropy at the CHEO Foundation, Jacqueline feels privileged to support our areas most vulnerable population, our children and youth. She is an aunt of five nephews, a hands on godmother and proud to be part of the lives of three beautiful step children. As an active advocate for CHEO and Roger Neilson House, Jacqueline’s proudest moments come when she finds donors who are interested in making a difference in the lives of children and youth and helps them start and build meaningful relationships through philanthropy. Brad first became involved with Roger Neilson House in 2009, when he joined the Ottawa Senators Foundation. Since then, he has played an active role raising awareness and funds for the house by working on numerous Ottawa Senators Foundation and third-party community events. Brad’s work with the Ottawa Senators Foundation allows him to meet and build meaningful relationships with many of the children and families at Roger Neilson House. In addition to his role in marketing communications, Brad is passionate about improving the lives of children and youth around the clock – he is involved helping disadvantaged youth in other countries as well as children in his own community through his volunteer work in youth sports and activities. Megan Wright is the Executive Director of Roger Neilson House and the Director of Palliative Care at the Children’s Hospital of Eastern Ontario (CHEO). Megan started as the ED at Roger Neilson House in 2014 and has been a valued member of the CHEO Management team since 2003. Megan received her Bachelor of Science in nursing at Ryerson University; she also has her Master of Science in Nursing Administration from the University of Toronto, and graduated from the Champlain LHIN Senior Leadership Program, among many other courses and achievements. Prior to obtaining her position at CHEO, Megan worked at both the Credit Valley Hospital and at the Bloorview MacMillan Centre, where she was a nursing manager. She has 20 years of leadership experience in the health care environment.